Summary: Looking to increase your site’s visibility and raise new funding? 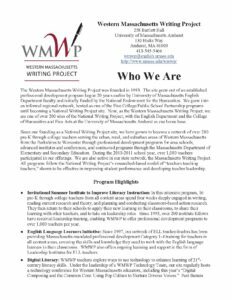 This resource from the Western Massachusetts Writing Project, developed as part of a comprehensive plan to increase visibility and raise new funding by educating others about its work, demonstrates how effectively key site information can be compiled into a “Who We Are” document for marketing purposes. Geared toward an audience of potential donors and university partners, this document enables the site to communicate clearly and concisely about its programs and their impact. Sites looking to promote themselves to similar audiences will find the attached document a useful model for developing their own promotional materials. Since our founding as a National Writing Project site, we have grown to become a network of over 200 pre-K through college teachers serving the urban, rural, and suburban areas of Western Massachusetts from the Berkshires to Worcester through professional development programs for area schools, advanced institutes and conferences, and contracted programs through the Massachusetts Department of Elementary and Secondary Education. During the 2010-2011 school year, over 1,000 teachers participated in our offerings. We are also active in our state network, the Massachusetts Writing Project. All programs follow the National Writing Project’s researched-based model of “teachers teaching teachers,” shown to be effective in improving student performance and developing teacher leadership…. In 2009-10, WMW offered 34 programs for a total of 1,496 program hours and attendance of 1,243 educators in our region. These programs ranged from one day workshops and conferences to one-week courses to our four-week Invitational Summer Institute and included both open programs offered by WMWP and school-based professional development programs. WMWP offers schools and districts a rich array of professional development programs, distinctive because they are led by practicing teachers, trained through our Invitational Summer Institutes, and because they are tailored to each school’s needs, not pre-packaged. We work with a wide range of Western Massachusetts public, charter, and private schools annually including, in the past few years, Springfield, Holyoke, Greenfield, Worcester, Sturbridge, Athol, Smith Vocational and Agricultural High School, Chicopee, Pioneer Valley Regional, Hampshire Regional, Berkshire Arts and Technology Charter School, Amherst, Hadley, and Hatfield schools.